Ultraviolet clarifiers (UVC) for controlling algae and preventing green water in ponds. Will effectively kill single-celled algae and keep pond water clear. 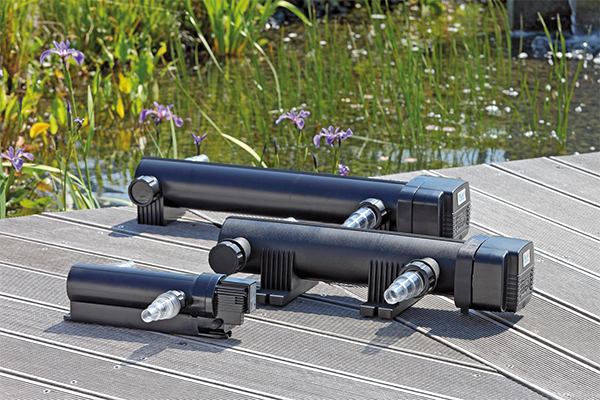 OASE Ultraviolet Clarifiers (UVC) eliminate green algae and pathogens in your pond. Vitronic is an entry level UVC. 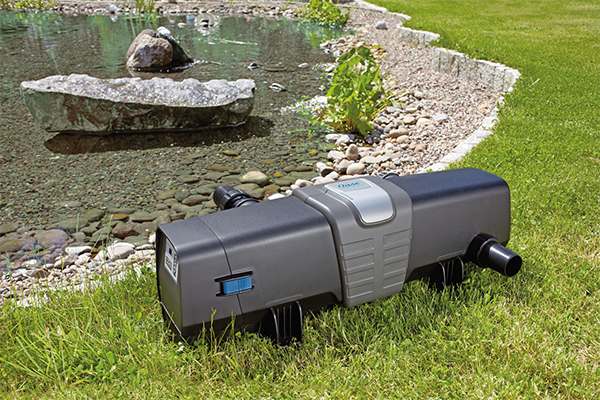 Bitron C has an innovative self-cleaning facility and the flow bypass system optimally matches the flow to your pond pump. Bitron Gravity is packed with the latest technology providing outstanding, performance. 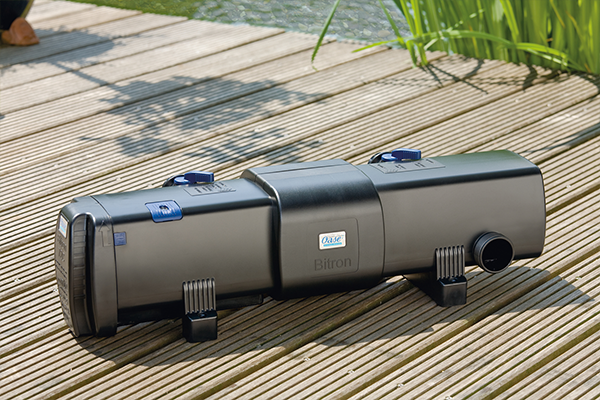 The new energy efficient Bitron ECO UVC feature a digital controller and are suitable for ponds up to 240,000 Litres. Ultra-Violet Clarifiers offer a high-tech, chemical-free solution to eliminate and flocculate single-celled algae blooms. Water is firstly passed through the UVC which causes single-celled algae to clump together, before reaching the filter which traps the algal debris. Single-celled algae is the cause of green water in ponds and the UV Clarifier will dramatically reduce or eliminate this. UV technology also has the benefit of killing bacteria, parasites and pathogens carried in the water, promoting good fish health. Vitronic UVC’s are the entry level UVC model from OASE Germany and are capable of treating bodies of water up to 60,000 litres. They also feature the ability to integrate with the BioSmart flow-through filters. The Vitronic 18w, 24w and 36w UVC can be mounted directly to the BioSmart 18000 and BioSmart 36000 filter boxes. The Vitronic UVC mount to the two water inlets on the BioSmart filter box making it a very tidy and neat installation. The Oase Vitronic is suitable for ponds up to 60mᶟ. Bitron C UVC’s are the advanced model of UVC which are capable of treating bodies of water up to 110,000 litres. They feature a built-in cleaning impeller which prevents debris and dirt building up on the quartz sleeve which ensures the maximum ultraviolet light penetration through the protective quartz glass sleeve. The OASE Bitron range all feature a special bypass mechanism which will allow the optimum flow-through rate of water and the adjustable handles can be used to match the flow rate of your pond pump. This innovative mechanism ensures the maximum kill rate of algae without restricting the flow rate of the pumped water. 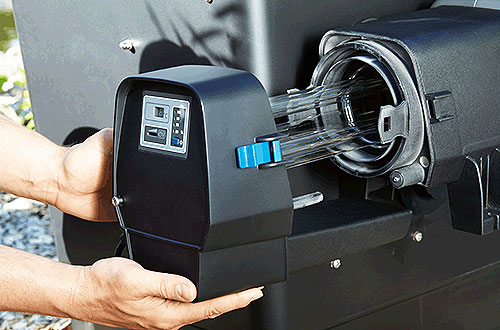 Bitron UVC’s feature the ability to integrate with BioTec ScreenMatic filters. The Bitron, much like the Vitronic, mounts directly to the ScreenMatic filter boxes through the two water inlets. Suitable for ponds up to 110mᶟ. Bitron Gravity UVC’s are suited to high demand gravity-fed applications. These units are designed to be as flow efficient as possible to prevent any restriction. The stainless steel body increases the reflection amount within the internal chamber making more efficient use of the UV light available. 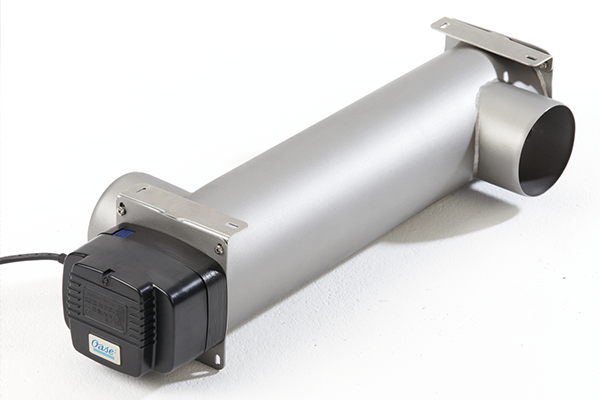 Bitron Gravity UVC’s mount onto ProfiClear gravity fed installations and each 55w UV is suitable for ponds up to 70mᶟ.